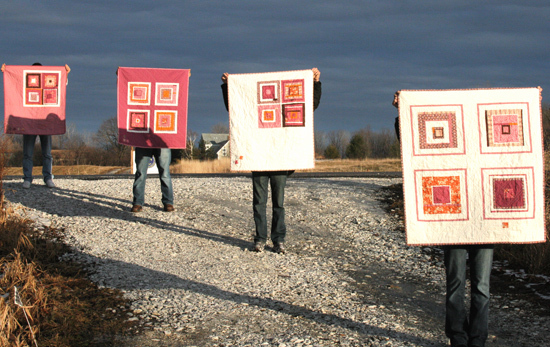 Remember the quilt blocks I made using Denyse Schmidt’s purple and orange Hope Valley fabrics? I ended up with 16 blocks, and at first, figured I’d just use them all to make one largish lap quilt, as usual. As I kept looking at them though, I kept coming back to this idea I had of a series of smaller quilts, all using the same fabrics but in different combinations. I couldn’t get it out of my mind, so here you have it! I used 4 of my Hope Valley quilt blocks for each quilt, and then did a slightly different arrangement for each one, changing up the placement of the blocks, the borders, the background colors, and also the quilting. My favorite part, which you can’t see too closely here, is the addition of tiny squares somewhere on the quilt front which I used as a type of labeling system to signify the order in which they were made. You can see the 1 little square in the quilt on the far right, which was the first of the series. Love it! The backs are all pieced, using up the remaining printed and solid fabrics, and each quilt is bound with one of the purple Hope Valley prints. I’ll post a closer look at each one over the next couple of days! This entry was posted in [search] Square-in-Square Quilts, 2009 Finished Quilts, Finished Quilts, Posts about Quilts, Quilts and tagged baby quilts, denyse schmidt, handmade, hope valley, improv blocks, quilt, quilting. Bookmark the permalink. Whit finally gets a quilt! fantasmaGORGEOUS! loooove the little square “markers”. i can’t tell you how much i love these. They are beautiful! I noticed the little square markers immediately. I was wondering if you appliqued them on, or if they are sewn into the quilt? Gorgeous, as always! I’m definitely going to have to get my hands on some Hope Valley, it’s really growing on me. Love each quilt individually, and adore them as a series! I cannot exactly say I like to top of the quilts, but I LOVE the backing and the idea of the square boxes to indicate the sequence of the quilts. And I love how you use these four people to portray the quilts. Love the idea of variations on a theme… beautifully done. what a great idea, i LOVE them! Lovely – one and all!!! Love the locale/composition of the photographs. So lucky of you to have 4 volunteers! These are all wonderful, so creative. You’re very lucky to have such great Quilt Holders! I love how you turned one sort-of-typical (though what I’m sure would have been lovely) quilt into four very-something-specials. Not to mention their sequenced numbers…a new signature? I think so! And the photography? Fantastic. I can’t even pick a favorite. Really cool. Love the little squares. And your backs are fantastic as usual. The quilts are nice, but your helpers must really love you to march around to the various settings-! Really quite striking photos, would look great in a quilt calendar. Good job from the holders too! And how satisfying to finish 4 quilts instead of just 1! These are just wonderful! Love the squares as numbering system and the willing crew to display them :). Great Hope Valley inspiration! Thank you! The marking system is my favorite part!! LOVE these and how you photographed them! 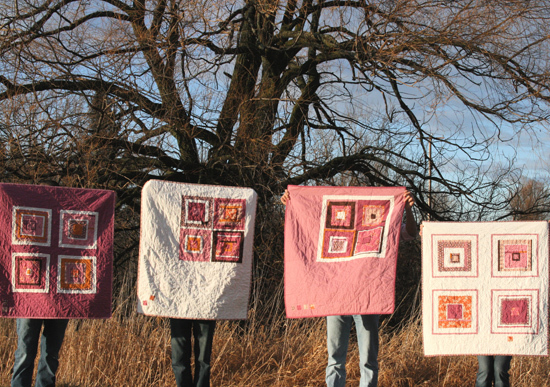 great quilts… and great team of quilt holders!! They look great! Can’t wait to see individual quilts close up. You are so creative… brilliant concept – the quilts & photography! I love the way you have taken the photos. Yay quilt photo assistants. Really beautiful quilts that look awesome with the dark grey sky. 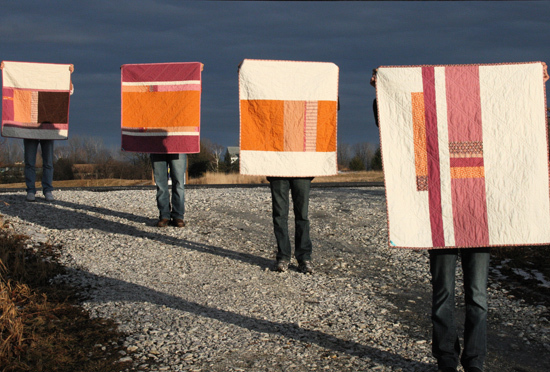 Such a great idea to make four quilts! I also love the square numbering system. The way you arranged the quilt and their holders makes the photos even more fun. Thanks for all the sharing you do! Cool pictures! The quilts are beautiful. beautiful! what a clever idea to have them all photographed like that! I love them all, waiting for my hope valley to arrive on my doorstep, at first I was a bit so so on the range but now that I’m starting to see it made up I am just loving it!!!!! LOVE THE QUILTS!!! They are sooo pretty and i love how you took one design and made it into four smaller quilts. The little squares to tell which order you made them in is a really smart and creative idea. Sooo ADORABLE! All really gorgeous! I love the squares to mark which one the quilt is in the series. You have incredibly patient friends/family to pose for pictures – the shots crack me up! 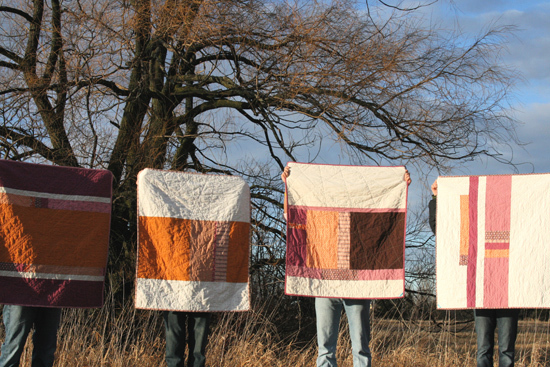 What a great way to photograph a series of quilts! yes, these are all fabulous, AND i just love quilts with legs! so FOUR quilts with legs?! heaven!